Dr. Kelly Anez was born and raised in La Canada, California. She was interested in horses from a young age and rode jumpers as a youth. She graduated with a BA in English Literature and a minor in Economics from University of California, Los Angeles and then received her Doctor of Veterinary Medicine from the University of Minnesota in 1995. Dr. Anez brings more than 16 years experience in small animal medicine and surgery to Pacific Crest. In addition to small animal, Dr. Anez also does equine anesthesiology and reproduction. 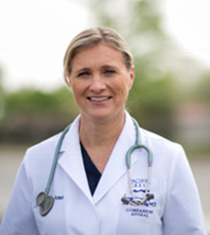 When not at the clinic, Dr. Anez can be found at the Tulare-Kings Veterinary Emergency Services clinic where she has practiced emergency medicine for 10 years. During her spare time, Dr. Anez can be found with her three children and her horse Wellington, with whom she is training and competing in dressage.